When you hear that the world's population of honeybees is in decline, your initial reaction might be one of joy. Those pesky summer stingers only cause you fear and pain. Yet your opinion might change when you learn that the loss of these insects has a detrimental impact on the human race. Albert Einstein is reputed to have said "if the bee disappeared off the surface of the globe, then man would only have four years of life left." The process of pollination is what gives us fruits, vegetables and even alfalfa used in livestock feed. According to Achim Steiner, Executive Director of the United Nations Environment Programme (UNEP), 100 crop species are used to feed 90 percent of the world population and over 70 percent of these crops are pollinated by bees. As the human population continues to climb to over 7 billion, and more than 1 billion are already without access to enough food, the decline of honeybees will only lead to decreased food resources for people. Both the manufactured, domestic honeybee and those in the wild are facing a dramatic population decline. This trend was first noticed in Europe in the 1960's and has accelerated in North America since 1998. More recently, beekeepers and farmers in China, Japan and Egypt have noticed sudden decreases in the honeybee numbers. Known as a colony collapse disorder phenomenon, scientists are racing to pinpoint the causes and implement solutions as soon as possible. Neonicotinoids are pesticides that are illegal in Europe due to their toxicity though still used in the United States. Studies conducted at the National Institute for Agricultural Research in France suggest common pesticides make it difficult for honeybees to locate their hive. In the experiments, bees were fed neonicotinoid-laced sugar water and placed a half mile from their hive. Radios on the bees signaled that 10 to 31 percent of the bees did not return to the hive, depending on whether the territory traveled was familiar or new. A similar study on bumblebees at the University of Exeter in England resulted in an even greater loss of 85 percent. A 2011 report from UNEP notes other factors that contribute to the decline of the honeybee population. Flowering plants are removed by land development or sprayed with insecticides which are ingested by the bees through the pollen and nectar. Air pollution is another obstacle bees have to contend with when seeking the few plants that remain. 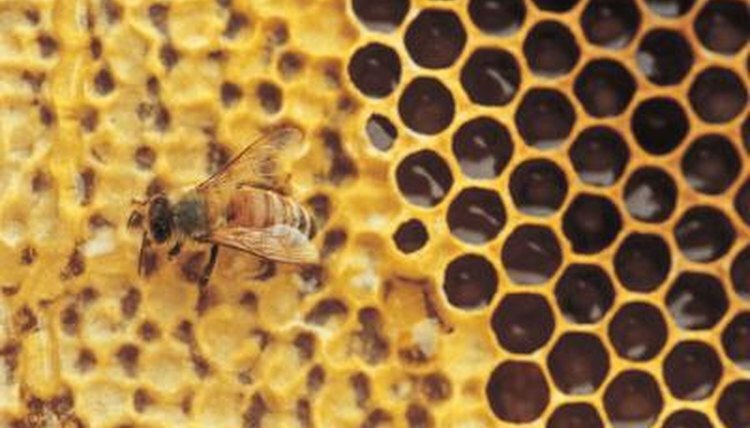 Honeybees are also vulnerable to mites, viruses, fungi and other pathogens. The varroa mite leaves young and adult bees with deformed wings and abdomens as well as a shorter life span, while the tracheal mite clogs the breathing tubes and affects a bee's ability to fly. Authors of the UNEP report called for incentives for farmers and landowners to maintain bee-friendly habitats. This would incorporate flowering plants near crops and a greater consideration for the timing and application of pesticides or other chemicals. Biological control agents can be substituted for insecticides -- for example, a fungus that would attack mites but not bees -- though an effective delivery system has yet to be determined. While domesticated bees have typically been kept in airtight facilities to protect them from the elements, once mites get in, there is a high rate of breeding. Ventilation has cut down on mite reproduction and proved that the bees adapt to any resulting temperature changes. Scientists are also working on locating wild bees with natural tolerances to mites. If found, they hope to isolate the genes responsible and breed domestic honeybees more resilient to mites. EarthSky: How Many Hungry In A World With 7 Billion? On What Continents Are Bees Not Found?